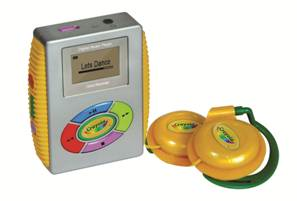 Take your tunes with you on this silver Crayola 2GB MP3 player ! It can store up to 96 hours of music (approximately 1,800 songs) and features USB mass storage to copy and store data files from a computer. The LCD screen lets you scroll between songs, read lyrics, or set up the menu. This MP3 player even lets you record your voice. It supports MP3, WMA, and WAV formats. Includes earphones, necklace loop, USB cable, instruction manual, and Music Express software. Music Express converts your CDs to mp3 format and lets you find and organize your music, burn CDs, and more. Dimensions: 3"L x 2.25"W x 0.75"D.
If you’re taking a plane or car ride ANYWHERE this summer, kids should have their own set of tunes to enjoy. Crayola has come up with a MP3 to make it fun for kids to come up with their own play list as well as encouraging them to have their own sense of ownership for kids also! The product is being released by Sakar International (http://sakar.com/) and along with a wide array of other kids devices and other electronic devices for all ages, this company is going out of its way to stay on top of electronic trends in the market. In trying out this out I was impressed to find how easy it was to set up and use. With easy uploading capabilities and a 2GB storage capacity this MP3 will last a child quite a while and at the same time will allow the child's interests in music to change as they change also. The buttons on this are intuitive and even my 6 year old was able to catch on quick and use this with no problem. Overall, for the price, durability and ease of use, this MP3 is a must have for kids that are begging you for their own MP3 or for that special gift that you have been wanting to provide your child also!